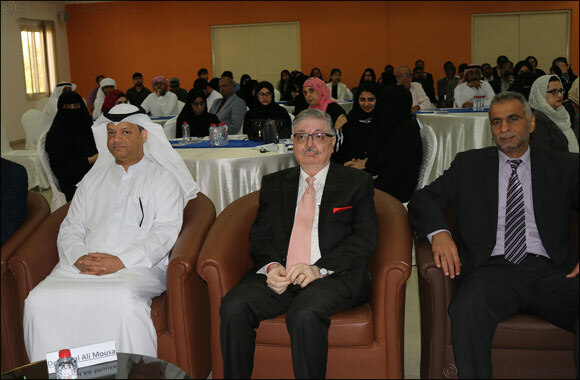 Dubai, UAE, March 31, 2018: Skyline University College hosted the National Seminar on Case Studies and Research on March 26, 2018 at SUC campus. The Chief Guest of the event was Dr. Faisal Ali Mousa, Chairman of FAM Holding. Dr. Mousa delivered a motivational speech where he shared his experiences of a journey starting from 3000 dirhams to 3 billion dirhams. He talked about the challenging times of his career as well as the strategies and the principles he always adhered to. SUC Professor, Dr. Gouher Ahmed was the first speaker of the seminar who discussed the topic, “Case Research Some Issues” followed by the welcome remarks by SUC Dean, Dr. Amitabh Upadhya. Other guest speakers of the seminar were Dr. Narjes Haj-Salem of the College of Business Administration, University of Sharjah; Dr. Christopher Abraham, Head of SP Jain Dubai Campus and Senior Vice President for Institutional Development at SP Jain School of Global Management and; Dr. Geeta Bajaj, Head of Academics, IMT Dubai. The speakers discussed various concerns on developing cases, teaching cases to business students, and the changing business environment among others. Dr. Narjes talked about the ways to develop cases and intricacies of case teaching to business students and further discussed the ways to select the right cases for the different levels of the students, and how to balance the spontaneity and planning during the case teaching in classes. Dr. Christopher talked at length about the changes in business environment and the fast-paced changes in technology. He emphasized the point that there is a need to break the domain barriers and the people from the different domains like business, technology, and art can collaborate on developing relevant cases, which can add immense value to the students’ learning. Lastly, Dr. Bajaj shared her experiences about developing the cases in India and UAE. She talked about various incidents while doing the field work for case writing. The seminar was successfully organized by SUC Research Committee chaired by SUC Professor, Dr. Gouher Ahmed and Skyline Business Journal Committee.